The Billionty-Oneth Geek: 360! Huzzah! 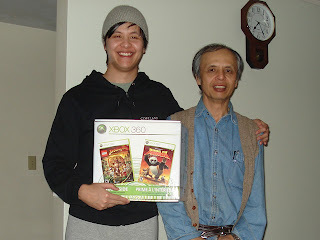 My dad woke me up today with the delight of an XBox 360!! I've wanted one for about 2 years now and finally those dreams have come to fruition. It was on sale at Best Buy for $240, so hefty savings from the regular $300 retail price. My dad is pretty awesome for doing this, I didn't even really ask for it. After delivering it, he went back to work shortly after. Me and my brother ate some lunch and did some light Boxing Day shopping. I went to get Gears of War at Best Buy for $20 and my brother went to the wine store to buy 2 bottles of wine. As well, my sister, while out braving downtown Toronto with her friends, snagged a Super Mario Galaxy for $30 at HMV. What a glorious day at the Lam household for gaming! Ha- welcome to the world of sleepless nights:P Are you planning on buying the subscription to Xbox Live? Nicely done. I got a PS3, and felt exactly the same way. The gift of gaming, the best gift of all!